Riad Lunetoile, situated in the heart of the Medina, with sea-views from the top terrace and from apartment 5, is the ideal relaxing, comfortable, holiday home / guest-house / B&B, to rent, in Essaouira. Ideal for surfers, individuals, couples or families... our Moroccan hospitality will enthrall you.....so, Submit yourself to a gentle introduction to true Moroccan hospitality, mixed with a little European comfort, and spiced up with a few Indian accessories. Enjoy all, that the Orient, has to offer, whilst still being in Africa! 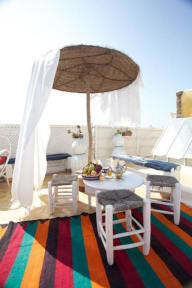 Our riad can accommodate up to 16 people and is ideally suited to everyone - individuals, small groups, or families. We can arrange additional beds and rooms. Please read our Things to Note below before booking.